It was a busy weekend of birthday celebrations (we had 2) and important family events in my household (our youngest is moving into her first apartment!) and as such, I didn't take the opportunity to spend a couple of hours of quality time at the keyboard. While I've got a good start on a missive entitled "Twelve Charts Tell The Story", this piece will have to wait, as there just wasn't time to do the idea justice. Hopefully, I'll be able to knock the remainder out by mid-week. So, to start the week, I'll let the indicator boards do the majority of the talking. 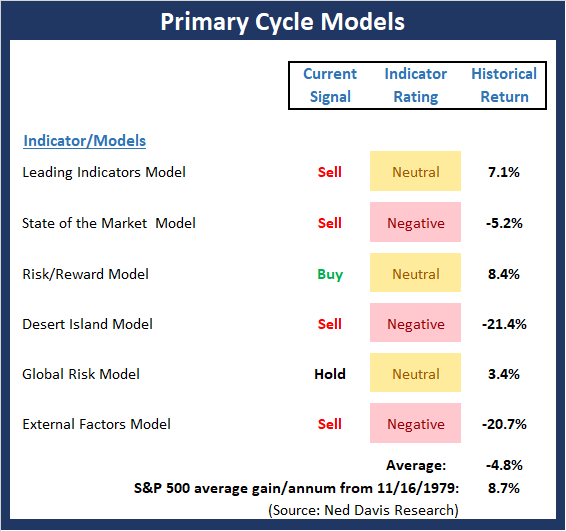 In short, while the trend and momentum indicators continue to sport an awful lot of green and the Fundamental Factors remain constructive, the Early Warning and "Primary Cycle" boards both continue to give me pause. In a perfect world, with stocks overbought and sentiment becoming extreme, the market would pull back a bit to relieve some of the extreme overbought/sentiment conditions and provide an entry point for those under-invested folks who were silly enough to think that a big decline in the stock market might be meaningful. I know, I know, such thoughts are sheer folly, right! But so far at least, the bulls have not been accommodative and all dips - which have largely been limited to intraday affairs - have been bought on a consistent basis this year. However, with the S&P currently sitting at an important technical juncture and the table "set" for at least some sort of pause/pullback, it will be interesting to see if the bears can get up off the mat and get something going - if even for a few days. But for now, let's dispense with the objective musings and get to the indicators and market models.